Most wineries are doing some kind of social marketing. There’s OK stuff, there’s not-so-good stuff, and there’s stuff that actually looks harmful to brands and eyeballs. On the other end of the spectrum are brands who are ABSOLUTELY KILLING IT on social. They treat social like the virtual world fit is – full of critics, press, distributors, customers (both existing and future), and potential partners. They make friends, educate, make people laugh, share good news, give beauty and win admiration. In fact, some winery brands have been entirely made from social. We could explore the subject of winery social marketing for days, weeks, months… even years. (and we just might) Topics like WHAT makes great winery social marketing. HOW they’re doing it. Brand and design consistency. Types of content. Content topics. Photography style. Color palette. Frequency of posting. Customer engagement. Community management. Influencer outreach. Co-branding. Cause marketing. Hashtagging and emoji strategies. And… on and on and on. But the greats? They do all of the above, and do it well, without even trying. And whether they’re trying or not, they’re doing a heck of a job. 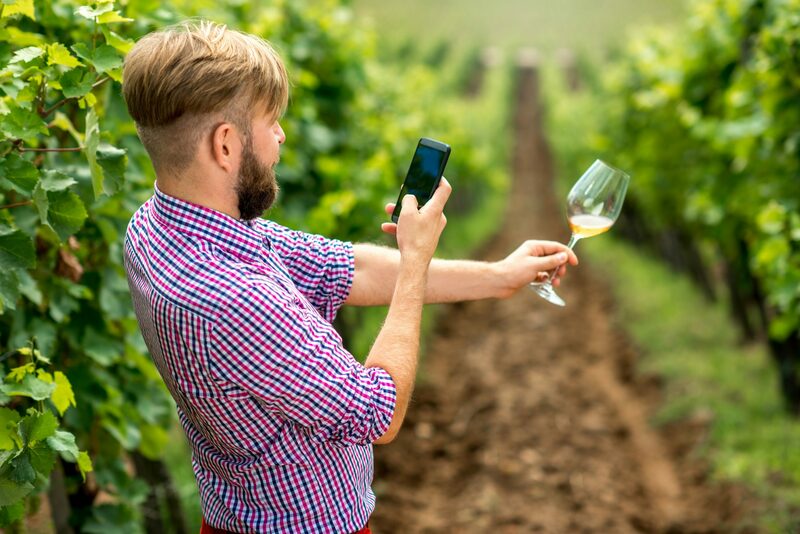 So before we go deep into the nuts and bolts of how wineries are succeeding in the social world, we’d like to tip our hats to some of our favorite winery social brands. You can’t really talk about winery social marketing without talking about Hardy Wallace, winemaker and founder of Dirty and Rowdy Family Wines. A bit of a celebrity in both the social marketing and winery communities, his wine career started in 2009 when he won the “A Really Goode Job” contest put on by Healdsburg’s Murphy Goode Winery, becoming the winery’s wine writer and social promoter. As a result of the contest and Hardy’s work, Murphy-Goode total sales increased 72%, Direct to Consumer sales increased 133%, distribution presence increased 60%, and CPM went from $7 to $.24. Seriously? Those kind of numbers are enough to make any winery go bananas. In 2010, Hardy and his friend Matt started their own label, Dirty and Rowdy, which is quirky, unusual, and highly successful. The marketing comes from the heart – a true reflection of the personalities behind it – highly likable and loads of fun. Unlike many wineries who treat social marketing as an adjunct to other marketing activities, Dirty and Rowdy has made social the core of their brand. Instagram seems to be the heart of their social, and as it’s tough to separate Hardy (@dirtysouthwine) from D & R (@dirtyandrowdy) take a look at both. Hardy is a genius at building relationships. Notice the generous spotlighting of other wine brands he enjoys, friends in the business, restaurants, and shops, the useful information on events and wine availability, the personal storyline depicting family and friendships, and the attentive response to any and all comments. Humor, authenticity, and love shine through the feed. You can’t help but respond. It doesn’t get much more “cool-kid” than Scribe. But, that’s who they are, and they do it beautifully. In the often stodgy, over-produced world of wine marketing, Scribe’s brand’s rustic elegance is highly innovative, and speaks to their millennial target with grace and ease. Scribe has a beautiful estate (the Hacienda) renovated by brothers Andrew and Adam Mariani. It puts forth such perfect imperfection it was featured in Architectural Digest. A winery can dream, right…? In keeping with their target audience’s lifestyle, social is a huge part of who they are, centering around Instagram. Like the estate itself, their imagery is young, authentic, and curated, filled with vibrant faces, good times, and an old-school hipness. Their manners are impeccable, with a community manager who responds to all requests, questions, and comments with attentive courtesy. (notice a trend here?). Even the visitors included in their images look like they’re styled by a casual boho vintage-shopping stylist, and the setting showcases their wines in an understated, artful way. Check them out on Instagram – @scribewinery. Their Instagram feed is populated with pretty pictures of Rosé wine – in the bottle, in the glass, in the plastic cup. Anything pink gets shot at their feed, whether fluffy sunset clouds, celebrities wearing pink, pink peonies, a pink toilet. Captions are pop culture-filled, silly, and girly, like their hit lyric captions centered around Rosé. One post: “Shine bright like a Rosé.” A few days later: “I know what your Rosé did last summer.” If you don’t follow the top hits, those captions mean nothing. If you do… you giggle. It’s just so stupid. (said lovingly) Maybe all of us could use a little more silly, girly, stupid Instagram feeds in our lives. It seems their 38K Instagram followers (and counting) did. And these followers are snapping up the Yes Way Rosé tote bags, beanies, and $72 sweatshirts (thanks for the plug, Drew Barrymore!) they sell on their website. Wow, just wow. Check them out on Instagram at @yeswayrosé. In sum – these 3 brands are doing an incredible job of marketing themselves on social. They’re true to who they are, they’re great to look at, they have something to say, and they have boat-loads of likability. Their social has spawned followers, customers, visitors, relationships, sales, distributorships, and in the case of Yes Way Rosé, the brand in itself. And to think… some wine brands still don’t think social matters. Crazy. Stay tuned for more explorations winery social marketing. We’re just getting started. Sarah Pittenger is a Circa employee, co-owner of family winery Gros Ventre Cellars, and working mother to two small children and one crazy dog. When she can find free time, you’ll find her exploring the Sierra, walking vineyards with her husband, or reading a good book. About Sarah: Sarah Pittenger is a Circa employee, co-owner of family winery Gros Ventre Cellars, and working mother to two small children and one crazy dog. When she can find free time, you’ll find her exploring the Sierra, walking vineyards with her husband, or reading a good book.